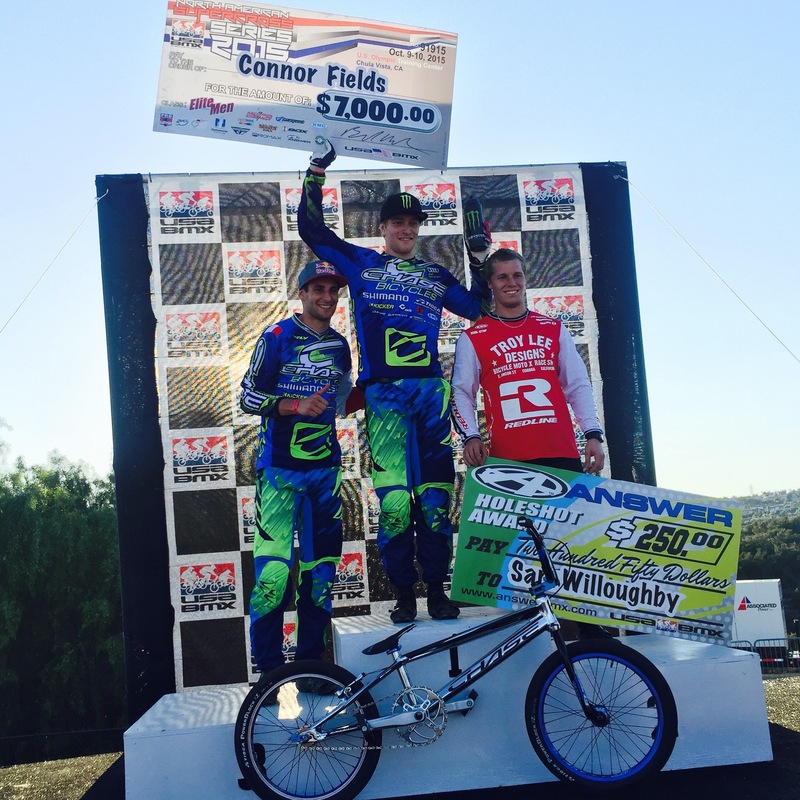 Connor Fields & Joris Daudet both win at the USA BMX North American SX Series! Day 1 of the USA BMX North American SX Series was held today in Chula Vista, CA. This event, in conjunction with the USA BMX Gold Cup West Finals, was stop #3 of the USA BMX SX series. A 2 day event, the USA BMX SX series does not only offer huge a huge purse for the riders, but the points count towards the overall USA BMX Pro Championship title chase. Connor Fields is no stranger to winning on the Chula track, as he has won a few key events on the Beijing replica track, including the USA Cycling National Championships and the UCI BMX Supercross World Cup 2 times in the past. So far in the 2015 season, Connor has been ultra consistent on the USA BMX tour, with 5 wins, (as of Before the race on Friday) making every main event so far this season on the USA BMX Tour. Joris Daudet, has been on a tear this season as well, with 6 USA BMX wins, and is currently leading the overall points battle for the Pro title. 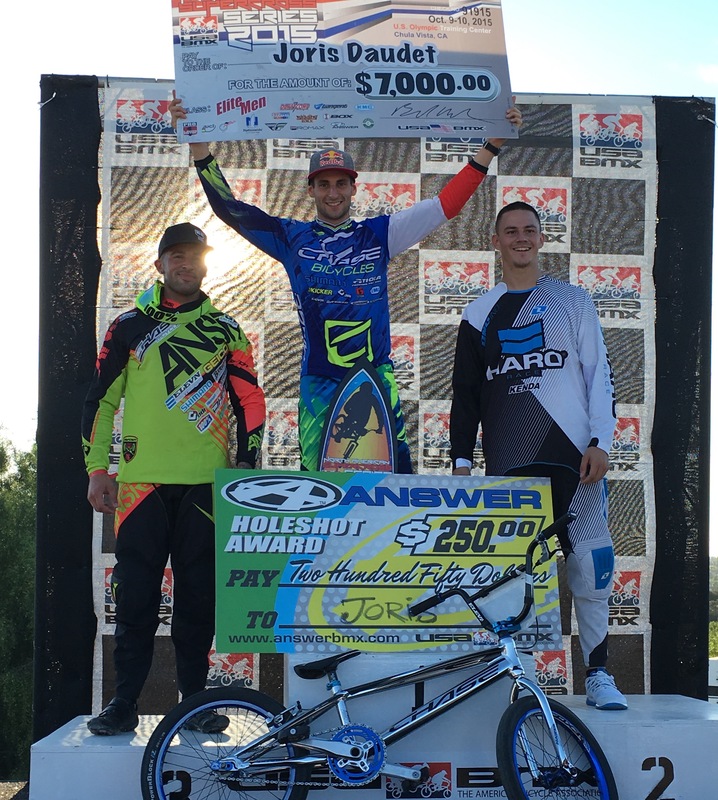 Joris was looking to add another win or podium in Chula Vista, to add on some more points towards the overall Pro title chase. Both riders made their way into the main event on Friday afternoon, and we ready to do battle with each other and Sam Willoughby, who has won 3 of the 4 USA BMX SX races so far this season, with Connor wining the other. When the gate slammed Connor looked to have a great start, but Sam just edged him out going into turn 1. Connor, who know this track maybe better than anyone, other than Mike Day, rode a tactful 2nd straightaway, and stalked Sam, all the way, until the berm jump, where Connor stayed low and inside, and pulled alongside Sam, and made his way around him as the exited the turn. Connor than rode a perfect lap, to take the win, with Sam in 2nd, and Joris just missing out on passing Sam at the line, coming in for the 3rd. Day 2 and both of the guys were once again on point, both easily making their way into the main event once again. This time when the gate dropped, Joris took the hole shot and lead into turn one. Connor was in 3rd behind Anthony Dean. Anthony had a bobble and slid in the turn, and unfortunately Connor went down, and would finish 8th. Joris continued his hot lap, and rode strong, all the way to the line for the win, with Anthony regrouping and finishing 3rd for the day. What a strong weekend for the entire Chase Pro team as well as the DHR/Chase team Pros. The riders will now head off to Oldsmar, FL next weekend for the 4th stop of the USA BMX North American race series. With 7 wins for Joris and 6 wins for Connor so far in 2015, they are 1 & 2 in the points, and will try to earn a few more next weekend. As always, thanks to all of our great team sponsons! © 2019 Excess BMX Components - Los Angeles, CA - USA - a division of BMX RACING GROUP - All rights reserved.